The Old Round Party; a Saturday afternoon's dancing in London in February. This is usually 2:30–5:30 at St Barnabas Church, on the junction of Grove Rd/Roman Road, Postcode E3 5TG. Note that parking north of the railway line is mostly residents only. I generally park in Lichfield Road and walk from there. The Old Round Camp; a weekend camping in Norfolk over the August Bank Holiday weekend. In its circulars giving details of these events it also passes on news relating to its members, usually births, marriages and deaths. The Old Round has significant overlap with London Pride, a London Morris side which also does Country Dance; apart from Morris tours they organise an annual dinner dance in January and a week's house party where they take over a Field Studies centre in the summer. Old Round members will be welcome to join in these events. 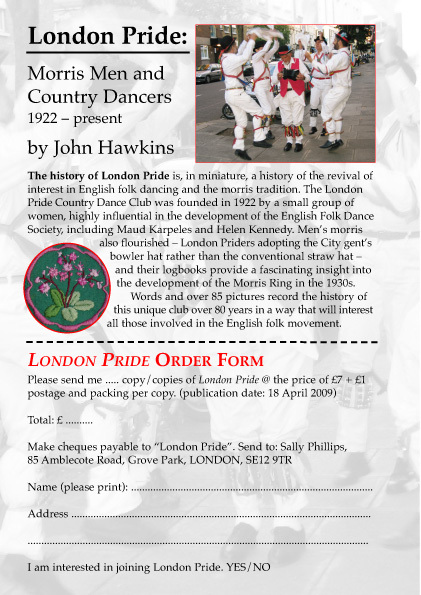 John Hawkins has written an History of London Pride you can buy.